Australia have made three changes to face England at Twickenham on Saturday after last week's defeat by Ireland. 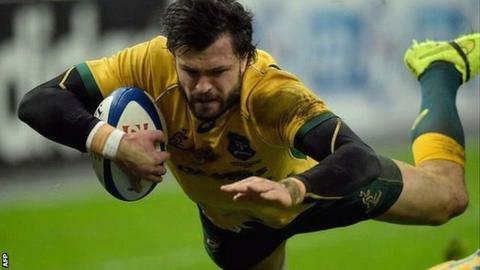 Veteran Adam Ashley-Cooper switches from the wing to outside centre to replace Tevita Kuridrani, who injured his ankle in the 26-23 defeat - the second in succession for the Wallabies. Rob Horne comes in on the wing while Sean McMahon returns to the starting XV at blind-side flanker. The Wallabies hope to wear black armbands in tribute to Phillip Hughes. Melbourne Rebels back-rower McMahon, 20, returns to claim only his third cap on Saturday after starting in the 33-28 victory over Wales and the 29-26 defeat by France. Lock Rob Simmons, 25, is set to win his 50th cap for Australia in the match. Wallabies captain Michael Hooper rejected suggestions of the match doubling as a World Cup "trial" ahead of the two teams meeting in the same pool at next year's tournament in England. "We won't be looking at it like it will set us up for the World Cup," he said. "Right now it's another opportunity to play at Twickenham. We're not calling it a trial match or anything like that." Australian coach Michael Cheika has delayed naming his bench, with Kurtley Beale, Quade Cooper and Will Genia all hoping for a spot among the replacements.